The Museum of Prehestoric Thera is one of the most important museums of Greece as it houses the findings belonging to one of the greatest regional civilizations of the prehistoric world. 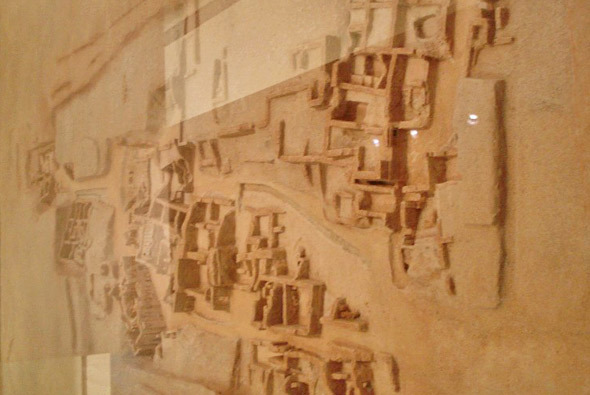 Given that the findings of Akrotiri are hosted in that museum, it is considered to be an outlier of the archaeological site of Akrotiri. The excavations carried out at Akrotiri area brought to light a greatly developed centre of the ancient world which had bloomed within the Aegean Sea 3,600 ago, in the 17th century BC. The ancient city was buried under the volcanic pumice which was erupted by the volcano of Santorini. However, the pumice was a means of conservation for a great part of items like vessels and wall paintings which have survived in a pretty good condition even nowadays, witnessing the grandeur of the buried city. The Greek archaeologist S. Marinatos was the first to have excavated the area of Akrotiri, in 1967. In fanct, he came to the conclusion that the ancient must have been situated in Akrotiri because it consists of a valley where the habitants would take advantage of its fertile earth. What is more, according to S. Marinatos, the position of Akrotiri, to the south of the island, should have been preferred by the islanders as it would protect them against the north winds and at the sate it would offer a safe place for ships anchoring when the weather would be bad. Last but not least, it was the closest point to Crete, the centre of Minoan civilization and it would facilitate the development of trading relations between the two islands. According to S. Marinatos, the volcanic eruption that occurred in Santorini in the 17th century BC, destroyed the Minoan civilization. The prehistoric ruins that were found in the mines of Therasia during the excavations for collecting pumice that would be transferred to the east for constructing Suez Canal as well as the ruins discovered by French archaeologists in Akrotiri on 1870 and by German archaeologists in 1900, are the reasons for which S. Marinatos had connected ancient Thera with the Minoan civilization. Even though that theory has not been confirmed by now, the fact that the findings had been preserved in such a condition, attracted the interest of archaeologists from all over the world and brought Santorini to the centre of the tourism in Greece. The wall paintings found in Akrotiri are the most famous and the most impressive items of that period. The art of wall painting appeared firstly in Crete during the middle Bronze Age. The palace that was built in 1700 BC was decorated with such paintings presenting several scenes usually inspired by Knossos and Phaestos. This specific art was majorly used for the palaces and other official buildings but it was spread in Cyclades and Dodecanese, in early 17th century BC. Later on, wall painting became a popular art even for thehabitants of the mainland yet it lasted by the time of the decline of the Mycenaean civilization. The habitants of the ancient city found in Akrotiri were affected by the Minoan civilization and it is witnessed by the use of the wall paintings they used both in public and private buildings. Far from being an evidence of the great development of that city, these wall painting offer as a great deal of information concerning the life of its residents. The color used are white (taken from slap-dash), black (from carbon). Red and yellow which were made of ferrous earthy welds and blue which was made of an artificial coloring imported from Egypt. In some cases the colors were mixed producing new tones. The art of wall painting appears also on the tripod tables which were used as worship vessels by the Cretans. These sacred tables were decorated with micrographics created by talented painters specialized in micrography. This kind of art has revealed high level drawings characterized by exceptional aesthetics. Ceramics has a long history in ancient Thera and of course in Akrotiri, as it5 dates back to the Neolithic era until the 17th century BC. Thousands of ceramic creations, either imported or produced locally, offer archaeologist important information on the private or religious life of the ancient habitants as well as on the relations between Thera and other Easter Mediterranean Sea cities. Most of them has survived as a whole and positioned at the very place their owners had left them before quitting their town. This revealers some interesting evidences regarding the way people used to organize their life inside or outside their buildings. 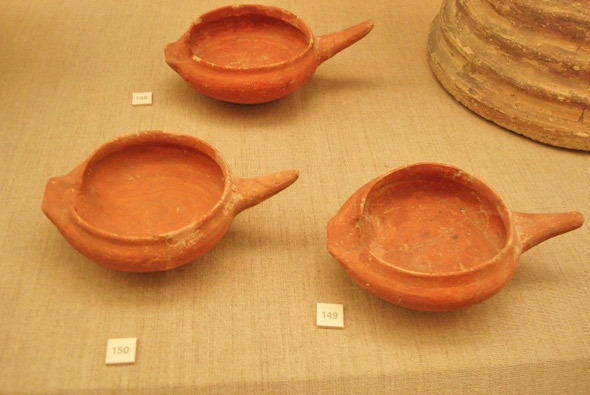 The clay made vessels were used for storing food or as cooking pans or as cups, some of them were used as lamps for lightening. 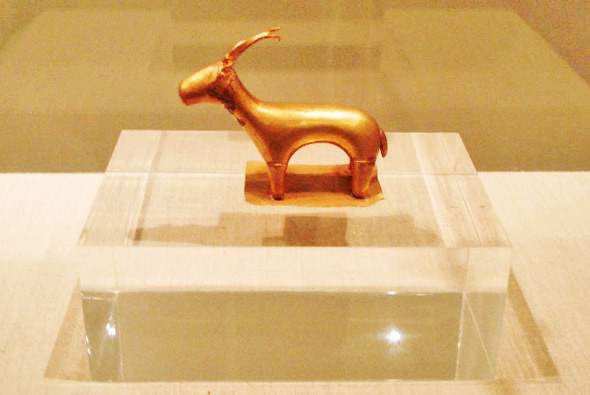 Only a few valuable jewellery have been found in Akrotiri as the habitants must have carried their precious belongings with them when they quit the city warned by the pre-eruption signs. The use of jewellery in Akrotiri has been taken for granted after the scenes of the wall paintings, where the women are depicted wearing a lot of jewellery such as necklaces, earrings, bracelets and anklets, contrary to men or young children figures which, according to the wall paintings, did not use to wear jewellery. Prehistoric Thera Museum Prehistoric Thera Museum .